With the Greenwood function, you can determine the natural tonotopic frequency of any point along the basilar membrane. You’ll only need to know the cochlear duct length, measured from center of the round window to the helicotrema, which corresponds to the length of the Organ of Corti. So, where would a 20 mm insertion reach along the tonotopic map of the basilar membrane? Single-turn arrays may claim to have “the most active electrodes”, but these electrodes often may not stimulate much of the cochlea beyond the high frequencies in the first turn. Now, do fundamental frequencies lower than 600–800 Hz really matter? Let’s take a look at a few examples of what falls below 700 Hz. It’s not just the drums or bass that’d be missing. For reference, Middle C (C4) on a piano is 261.63 Hz, and the highest-pitch open string on a violin is 659 Hz (E5). A standard guitar tuning doesn’t reach much higher than 659 Hz (E5 up on the 12th fret). On the other hand, above 700 Hz you’d still find most of the notes from a piccolo. 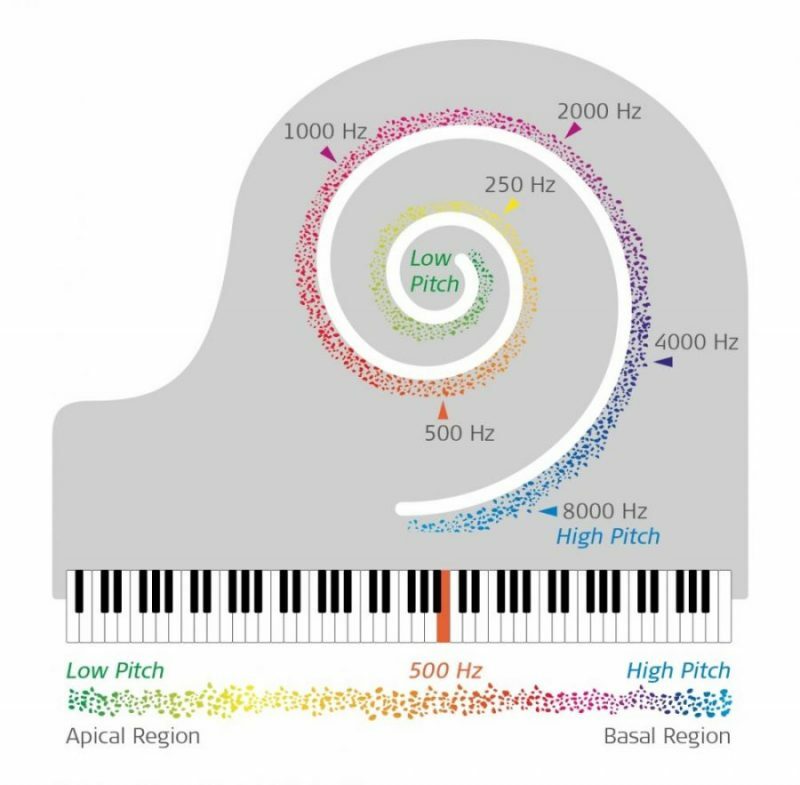 The natural tonotopic coding of the cochlea is like the tuning of the keys on a piano. Without a long electrode array to better cover the cochlea, most of the notes are simply out of reach, so lower pitches have to be transposed onto a higher octave. Lower frequencies can be mapped on single-turn arrays, but there will likely be a significant place-pitch mismatch.1,5,7,10 This unnaturally skewed pitch mapping may shift low frequencies up by roughly two octaves, so sound quality can be distinctly affected. With short arrays and single-turn insertions, outcomes can often be less than ideal. Flexible full-length MED-EL electrode arrays can provide exceptional cochlear coverage while gently adapting to the natural shape of the cochlea. What benefits can long electrode arrays provide? In part two of this post, we’ll look at the second half of the equation—rate-pitch matched coding in the apical region. Why is important to combine both place-pitch and rate-pitch match? Subscribe now to make sure you don’t miss part two! *Not all products, features, or indications shown are available in all areas. Please contact your local MED-EL representative for more information. Greenwood, D.D. (1990) A cochlear frequency-position function for several species–29 years later. J Acoust Soc Am., 87(6), 2592–2605. Hardy, M. (1938). The length of the organ of Corti in man. J. Anat., 62, 291–311. Ni, Y. Dai, P., Dai, C., & Li, H.. (2017) Cochlear implant-related three-dimensional characteristics determined by micro-computed tomography reconstruction. Clin Anat., 30(1), 39–43. Adunka, O., Unkelbach, M.H., Mack, M.G., Radeloff, A., & Gstoettner, W. (2005) Predicting basal cochlear length for electric-acoustic stimulation. Arch Otolaryngol Head Neck Surg., 131(6), 488–492. Landsberger, D.M., Svrakic, M., Roland, J.T. Jr., & Svirsky, M. (2015). The relationship between insertion angles, default frequency allocations, and spiral ganglion place pitch in cochlear implants. Ear Hear., 36(5), 207–213. Radeloff, A. Mack, M., Baghi, M., Gstoettner, W.K., & Adunka, O. (2008). Variance of angular insertion depths in free-fitting and perimodiolar cochlear implant electrodes. Otol Neurotol., 29(2), 131–136. McDermott, H., Sucher, C., & Simpson, A. (2009) Electro-acoustic stimulation. Acoustic and electric pitch comparisons. Audiol Neurootol., 14(1), 2–7. Pepiot, E. (2014). Male and female speech: a study of mean f0, f0 range, phonation type and speech rate in Parisian French and American English speakers. Speech Prosody, 7, 305–309. Eriksson, A., & Traunmueller, H. (1994). The frequency range of the voice fundamental in the speech of male and female adults. Prentiss, S., Staecker, H., & Wolford, B. (2014). Ipsilateral acoustic electric pitch matching: a case study of cochlear implantation in an up-sloping hearing loss with preserved hearing across multiple frequencies. Cochlear Implants Int., 15(3), 161–165. Arnoldner, C., Riss, D., Baumgartner, W.D., Kaider, A., & Hamzavi, J.S. (2007). Cochlear implant channel separation and its influence on speech perception–implications for a new electrode design. Audiol Neurootol., 12(5), 313–324. O’Connell, B.P., Cakir, A., Hunter, J.B., Francis, D.O., Noble, J.H., Labadie, R.F., Zuniga, G., Dawant, B.M., Rivas, A., & Wanna, G.B. (2016) Electrode location and angular insertion depth are predictors of audiologic outcomes in cochlear implantation. Otol Neurotol. 37(8):1016–1023. O’Connell, B.P., Hunter, J.B., Haynes, D.S., Holder, J.T., Dedmon, M.M., Noble, J.H., Dawant, B.M., & Wanna, G.B. (2017) Insertion depth impacts speech perception and hearing preservation for lateral wall electrodes. Laryngoscope. Epub ahead of print. Vermeire, K., Landsberger, D.M., Van de Heyning, P.H., Voormolen, M., Kleine Punte, A., Schatzer, R., & Zierhofer, C. (2015) Frequency-place map for electrical stimulation in cochlear implants: Change over time. Hear Res., 326,8–14.